General Mills is getting more interested in organic snack foods with its acquisition of Annie's. General Mills announced Monday that it's looking to bulk up on organic snacks. It's buying natural food company Annie's Homegrown for $820 million. The news boosted Annie' (BNNY)s stock 37% higher in after-hours trading. General Mills (GIS) shares were flat. 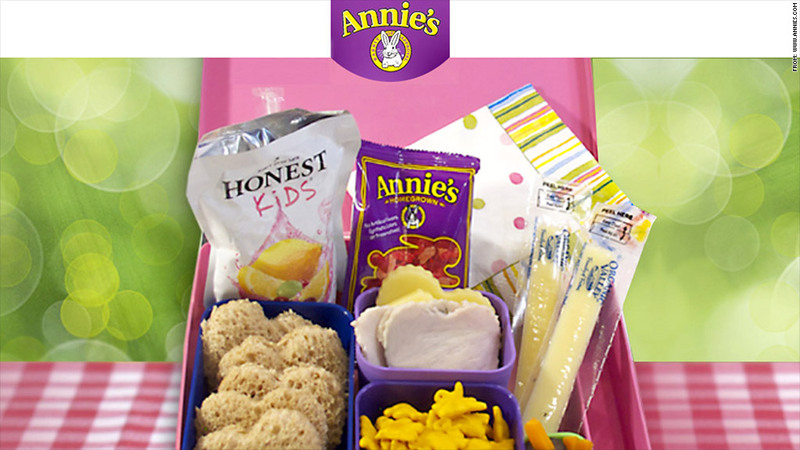 General Mills said Annie's can help the conglomerate's "snacks" and "convenient meals" categories. Snacks were the only U.S. retail category where General Mills saw any growth in its most recent fiscal year besides Small Planet Foods, a separate organic foods company it bought in 2000. U.S. retail sales account for three quarters of General Mills' profits. Annie's, which got its start a quarter century ago selling macaroni and cheese dinners in New England, has since expanded to snacks, dressings and frozen foods. The company went public two years ago after a decade under private equity control. Known for its bright packaging and bunny insignia, the company had $204 million in sales in 2014, a 20% bump from a year earlier. Profits rose even faster. General Mills said in a statement that Annie's will join a host of other companies in its organic food portfolio, which includes Cascadian Farm, Muir Glen and Food Should Taste Good.